Our spines are meant to be curved. Putting curves into an otherwise straight vertebral column increases its strength, flexibility, and ability to absorb and withstand shock. The spine has four main curves. The thoracic (mid-back) and sacrococcygeal (formed by the wedge-shaped bone, and tailbone, at the base of the spine) curves are primary, and are retained from the single big anterior (or forward) curve we rather appropriately call the foetal position that we developed while in utero​ (in the womb). A fairly severe scoliosis as seen from the front on an X-ray. This is a 16 year-old female. The cervical (neck) and lumbar (low back) curves are secondary, that is, are developed gradually after birth as the baby learns to hold their head up, sit, stand, and walk. Scoliosis comes from the Greek word skolios, meaning 'bent', and refers to a lateral, or sideways, curve of the spine. Again, there is a certain normal amount of variation - I am always telling my patients I have never seen a completely straight spine, viewed from any angle! However, scoliosis (or rotoscoliosis, as it is sometimes called) refers to a much more significant degree of curvature; normally more than 10°of lateral deviation from the central axis. 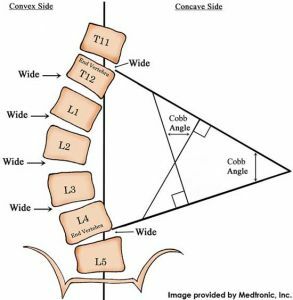 You can see how they calculate the degree of scoliosis to the left, using the Cobb angle. However, to think of scoliosis as simply a problem of the spine bending to the side is a bit simplified. It is not just a mere 'bending to the side', but a complex three-dimensional alteration of normal structure and function. Due to the way that the joints in the spine are shaped and fit together, it is impossible to bend to the side without some component of rotation as well. This is what the roto- in 'rotoscoliosis' is trying to emphasise. Scoliosis that does not involve this element of rotation is normally reflective of a [temporary] underlying cause, like muscle spasm, and as such is known as a functional scoliosis. These types of curves will often disappear with a change in position, such as sitting or lying down, or bending forwards. Results from degenerative changes in the spine as we age. Common, but normally mild. Develops in utero, and is present at birth. It is extremely rare, and typically results from malformations of the vertebrae or other developmental issues. The word 'idiopathic' is medical-speak for "we have no idea why this happens". Idio- means 'self', and -path indicates 'disease' or 'disorder' (in this case), indicating there is no clear external (i.e. non-you!) cause. Idiopathic scoliosis typically starts fairly early in life, and according to when patients are diagnosed, they are classified differently. Infantile idiopathic scoliosis (IIS) is when the child is diagnosed under the age of 3 years. Juvenile idiopathic scoliosis (JIS) is diagnosed between 3-10 years, while those diagnosed over the age of ten are classified as having adolescent idiopathic scoliosis (AIS)​. These classifications have some impact on the course of the condition, and likely prognosis. For reasons we don't understand, those with JIS seem much more likely to have the curves continue to progress, and require surgery, than other types of scoliosis. Is caused by disorder of the brain, spinal cord or muscular system, such as cerebral palsy, muscular dystrophy, myelodysplasia or traumatic paralysis. Neuromuscular scoliosis is also more likely to produce curves that continue to progress. The likelihood and severity of curves tends to correspond to the degree of neuromuscular involvement. There is a lot we don't know about scoliosis. But there is also a lot we do know, or at least strongly suspect. Scoliosis appears to involve the central nervous system (CNS, or your brain and spinal cord; or, as I like to call it, 'your genius four year-old') somehow failing to activate the deep spinal stabilisers as much on one side of the spine as the other. This creates abnormal loading, which creates altered feedback from the area. The abnormal loading also promotes asymmetric growth, leading to a worsening of the curves, which creates more abnormal loading and further asymmetric growth. This is often referred to as the Stokes vicious cycle, after the researcher who did a lot of work in this area. So anything we can do to break this vicious cycle can have potentially huge impacts. Your osteopath will perform a full physical assessment, not just of your back. Leg length differences, whether structural (e.g. due to different-sized bones in the legs) or apparent (i.e. functional, or to do with the way you use your body) can underlie, exacerbate, or even help to compensate for spinal curves. Rib function (or lack thereof!) is also a big factor in scoliotic presentations. The rotation and sidebending involved in rotoscoliosis can restrict the ribcage significantly, making the lungs and heart work harder. This then feeds back into the body's altered image of the area, further confusing the issue. Without going into too much detail, suffice to say that there is quite a lot that can be done about scoliosis, as long as it is diagnosed in time. Essentially, you need to retrain your brain's 'map' of the area, improve spinal stabilisation, and engage in active self-correction. Do you suffer from scoliosis?